At Conquest Joinery we manufacture and distribute up to 1 million pallets a year from our 2 acre site in Bolton, Greater Manchester. We run a fleet of vehicles that allows us to deliver nationwide. All the wooden pallets we produce are made to our customers’ exact specification – and when dealing with Conquest Joinery you can speak directly to the people who will design and make your wooden pallets. We manufacture a multitude of standard sized four-way and two-way entry wooden pallets, and also regularly design and create many bespoke sized wooden pallets for both new and existing customers. No wooden pallet is too small or too large for us, in fact we relish the opportunity to tailor our products to the specific requirements of our customers. The smallest wooden pallet we have manufactured to date is 500 x 650mm, whereas the largest wooden pallet we have made was over 6 square metres! 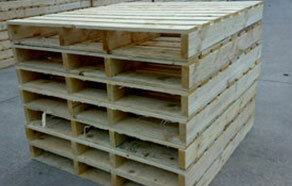 If you are in the market for wooden pallets, please feel free to contact us with your requirements. Every piece of timber we buy is sourced from renewable, sustainable and responsibly-managed forests. We import timber from all over the world, but a large proportion of the material we use comes from home-grown sawmills. Environmental issues are becoming increasingly important. As such we are now able to offer our customers the complete package by providing second-hand pallets and a repair service. Our ability in this sector is attractive to customers, as we are keen to offer cost savings wherever possible. Our reputation for quality and competitive prices means we supply companies of all sizes from sole traders to multinational corporations.